I don’t know what it is, but even in the middle of the summer, a hot and cheesy dip always sounds like a good plan. It doesn’t seem to matter how much a kitchen can suffer from oven heat in July; as long as the dip is worth it, I don’t mind. 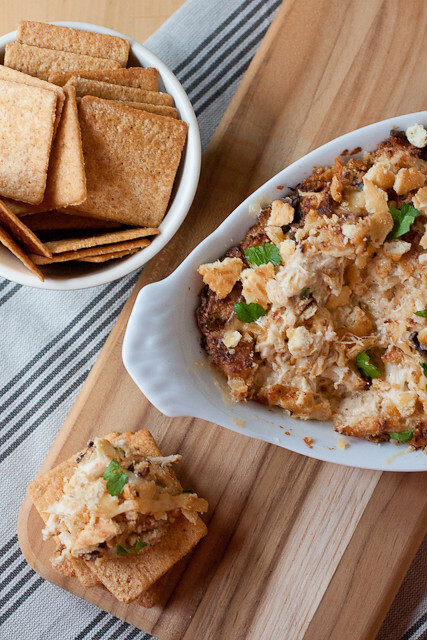 And this hot crab dip is worth it. 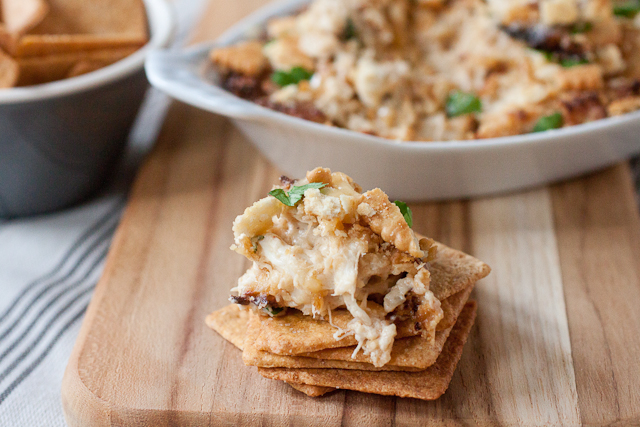 Actually, it’s perfect any time of the year but summer seems the right time for a crab dip, doesn’t it? I pulled this dip together the night before my family’s clambake last month then popped it in the oven for about 35 minutes right before the party started. 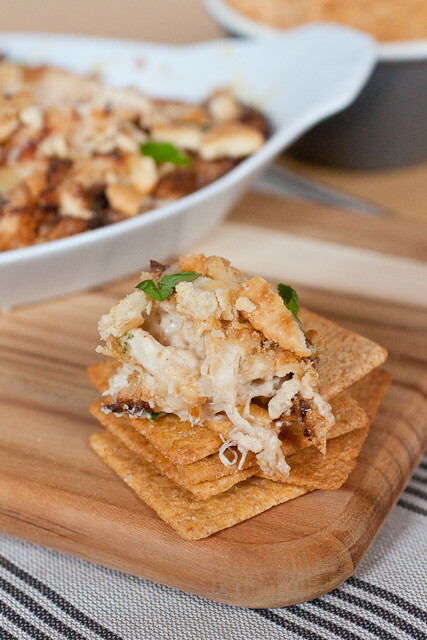 Out came a bubbling dish of cracker-crusted cheesy crab dip, not with wisps of crab meat here and there, but hunks of lump crab in every bite. It’s kept super creamy with the addition of cream cheese and half-and-half (so, definitely not health food) and it won’t seize up when it cools like so many cheesy dips can do – my cheese dip nemesis. If there’s one thing I would do differently next time, it would be to make more because again, it’s another dish I was sad to see come to an end. You can make this dip a day or two in advance. Just cover and refrigerate the dip before you bake it, adding 5 to 7 minutes to the baking time if the dip is baked right from the fridge. Preheat oven to 400° F. You'll need a 13x9-inch or 2-quart baking dish - no need to grease it. In a large skillet, melt the butter over medium heat. Stir in the shallots, cayenne, Old Bay, and dry mustard, and cook until the shallots have softened, about 2 minutes. Add the wine and cook for 1 minute, scraping up any bits on the bottom of the pan. Stir in the half-and-half and bring the mixture to a simmer. Add the cream cheese a couple ounces at a time, whisking to incorporate the cheese before adding more. Turn down the heat to low. By the handful, stir in the shredded cheddar and Gouda, again combining into the mixture before adding more. Stir in the lemon juice and Worcestershire sauce and allow the whole mixture to warm through for 3 to 5 minutes over low heat, stirring occasionally. Fold in the crab and half of the parsley (which I forgot to do). Transfer the dip to the baking dish and bake the dip for 15 minutes. After 15 minutes, remove the dish from the oven and sprinkle crushed crackers over the top. Continue to bake for an additional 10 to 12 minutes, until the dip is hot and bubbly. If the crackers seems to brown too quickly, lay a piece of aluminum foil over the top towards the end. Let the dip rest for 10 minutes before sprinkling the remaining parsley over the top and serving. Preheat oven to 400° F. You’ll need a 13×9-inch or 2-quart baking dish – no need to grease it. Note: You can make this dip a day or two in advance. Just cover and refrigerate the dip before you bake it, adding 5 to 7 minutes to the baking time if the dip is baked right from the fridge. Oooh yum! I’m going to have to try this. I’ve always loved the Cajun crab dip from Fresh Market, but alas we don’t have FM in WA. I’m sure this will be a new favorite! Made this today, so so so good.